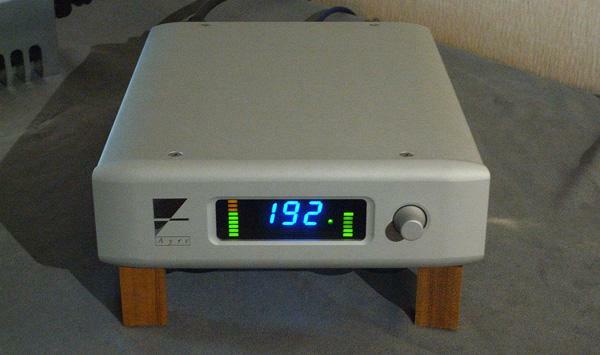 We didn’t listen to the Thoress F2A11 integrated amplifier, but just look at it: It’s awesome. 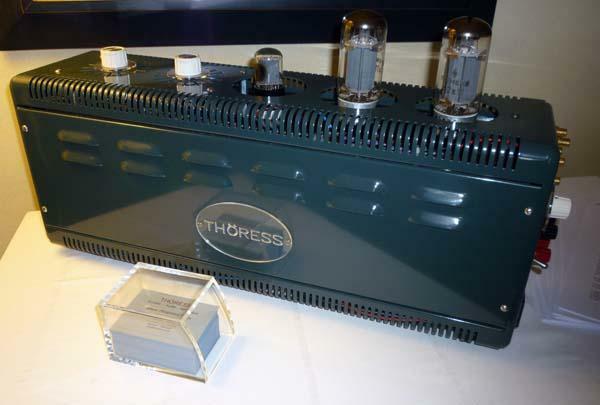 Entirely hand-built by Reinhard Thoress, the amplifier uses NOS Siemens F2A11 power tetrodes, which High Water Sound's Jeffrey Catalano explained, were popular in the Klangfilm cinema amplifiers of post-war Germany. Three line-level inputs are selectable by a rear-panel rotary switch, while separate volume controls for each channel can be adjusted using carefully matched high-grade rotary potentiometers. Why? I don’t know why, but it’s cool. According to Catalano, the sound of the F2A11 is crystal clear. It “just cuts through all the BS.” There you go. The Thoress F2A11 looks like some kind of a tank, delivers about 6Wpc, and costs $8000. It looks like the best-selling QB-9 USB DAC until you notice the level meters and the level control next to the display. This is Ayre's new QA-9 A/D converter, aimed at audiophiles who want to rip their LPs with the highest possible quality. The analog input is balanced and there are both USB and AES/EBU digital outputs. The ADC chip is fed by an input stage featuring Ayre's zero-feedback, discrete circuitry and it will output 24-bit LPCM at up to a 192kHz sample rate. However, there's no reason why it couldn't also output DSD data. The QA-9 will be in production in the first quarter of 2012 and while price is not yet decided, it will be somewhere between the QB-9's price and $5000, I was told. I am always intrigued by Wavelength's combination of cutting-edge digital technology and tubes. 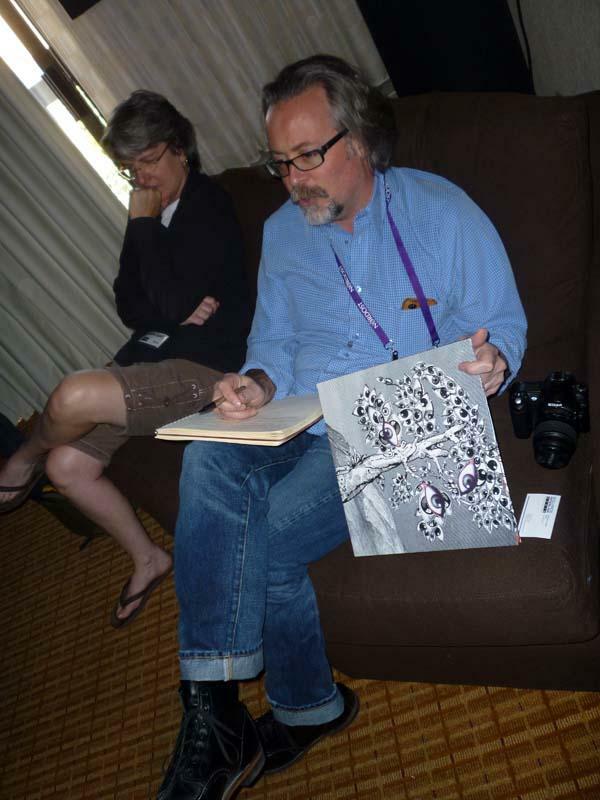 Their room at RMAF featured new developments in both areas. 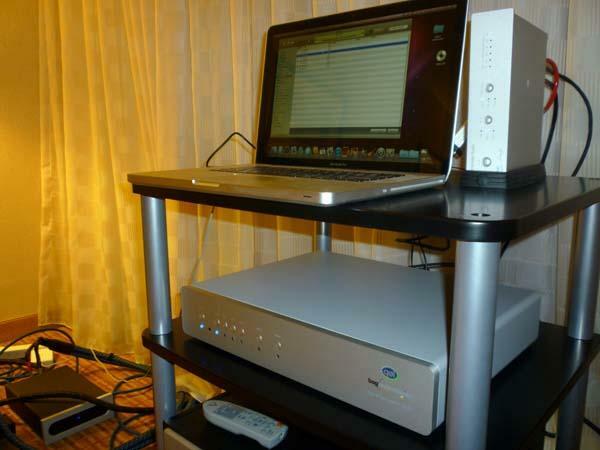 Shown in the photo are the latest HS 24(32)/192 version of the Cosecant asynchronous USB DAC (left, $4000), which features the new Denominator D/A module with 9016 ESS converters, and the new Royal preamp (right, $7500). 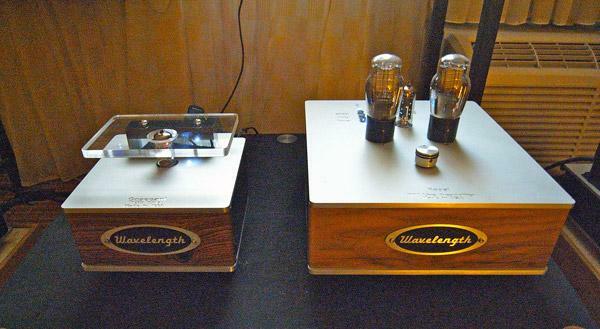 Wavelength's Gordon Rankin walked me through the design of the minimalist preamp. The input signal is taken to a transformer hat inverts the polarity and feeds high-precision Penny & Giles two-channel attenuator. The wipers of the attenuator are connected directly to the grids of two 71A triodes and that's it! (The third tube is a rectifier.) Because the single tube stage inverts polarity, the preamp output is again in correct absolute polarity. 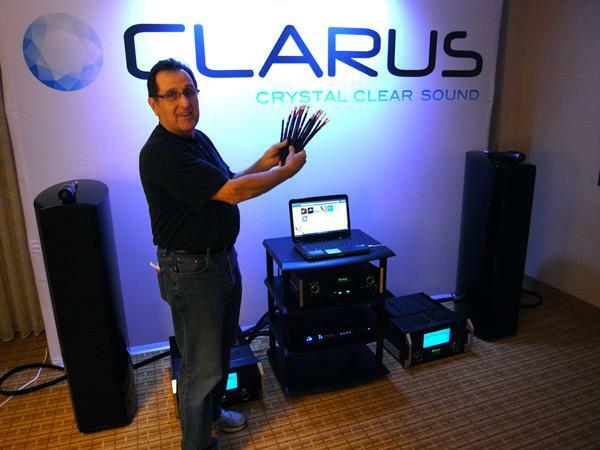 Joe Perfito's Tributaries cable line is mainly found in home-theater systems but Joe launched a new brand at RMAF, Clarus, aimed at the high-end two-channel market. Significantly more expensive than the Tributaries equivalentsClarus Crimson balanced interconnect sells for $1500/1 pair and the Clarus Aqua $800/1m pair, compared with $400/1m pair for a Tributaries balanced cableClarus cables are designed by Jay Victor, who, I was told, has previously contributed cable designs to Monster and AudioQuest, among others. The speaker cables feature a combination of a large-gauge rectangular conductor and multiple Litz-wound conductors. All the cables feature polyethylene dielectrics and all PC-OCC copper conductors. Joe was still fine-tuning the systemB&W 803 Diamond speakers, McIntosh MCD100 CD player/DAC and McIntosh monoblocks, and a Tributaries power manager when I visited the Clarus roombut I kidded him that the only non-Clarus cable in the system was the USB link from the laptop to the McIntosh MCD100. "That's a familiar sightand a familiar sound." When I walked into On A Higher Note's large room on the Denver Tech Center Marriott's mezzanine floor, the speakers being demmed were the Vivid B1s that I review in the October issue. I loved the sound of the $14,990/pair B1s in my room and they were doing equally sterling duty at RMAF, driven by a Luxman M600A amplifier ($8500) and a modified Revox open-reel recorder. A 15ips tape of a cello, piano, and double bass playing what sounded like a tango by Astor Piazolla, recorded in LA's Disney Hall by Yarlung Records, had an ease to its sound that allowed the music to flow. The room had a touch too much bloom in the upper bassperhaps the Synergistic "magic bowl" you can see on the post on the wall behind the speakers was fatigued after a long day adjusting the room acoustics. 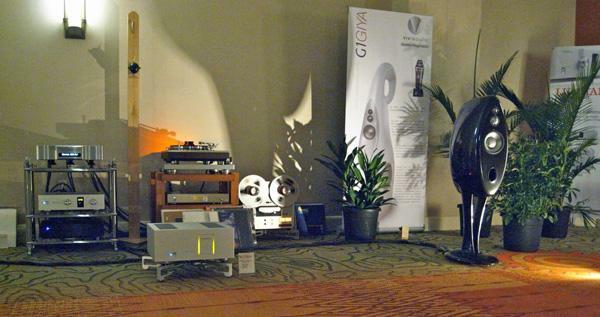 At a hi-fi show, there are many different types of demos. 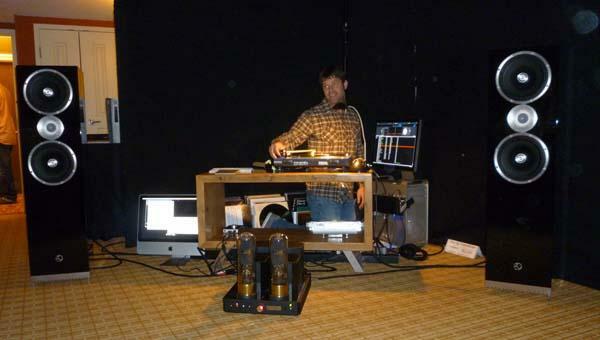 In some, there is music played casually, seemingly without much thought, selected either by the host or by an attendee; in others, music is carefully selected and introduced by your host, each track used to display certain characteristics of the system at hand; in others still, music is certainly played, but only after attendees are offered a detailed explanation of the gear in the roomwe learn about the technologies employed and the work that went into creating the productand we might even learn something about the art and science of listening. These last rooms are like demo-lectures, and they’re my favorite rooms. I feel like I’m in a classroom again, with one of my favorite professors. Similar to the system we enjoyed at the California Audio Show, here we heard the beautiful Sony SS-AR1 loudspeakers ($27,000/pair) with Pass Labs X600.5 power amplifiers and XP-20 preamplifier, Parasound Halo JC3 phono preamp, Clearaudio Concept turntable, and an EMM Labs XDS1 SACD player. Speaker cables were Kimber Kable's KS-3033, interconnects were Kimber's KS-1111, and AC cables were Kimber's PK-10 Gold. The system sounded rhythmically nimble and certain with big, fleshy images, a rich midrange, and warm, full bass. Easy to listen to and easy to enjoy. Something strange and awesome was going on in the Zu Audio room. The lights were low, an evil but alluring sound was filling the room, and the company’s Sean Casey was crouched down in a corner, surrounded by vinyl. Here we see AudioStream’s Michael Lavorgna in serious listening mode. (We can’t seem to keep him away from vinyl.) The album is Edward Ka-Spel’s O Darkness! O Darkness! 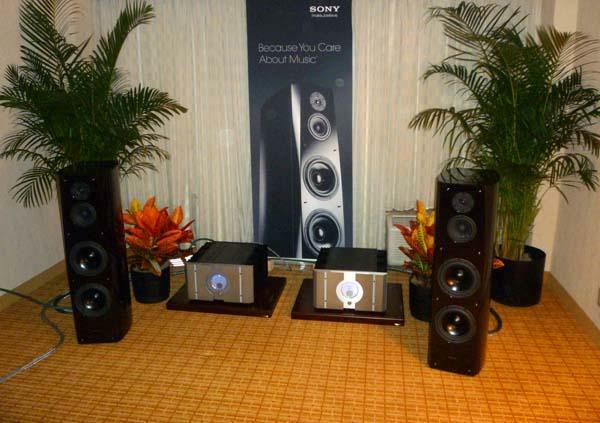 The Rocky Mountain Audio Fest is held at the Denver Marriott Tech Center. 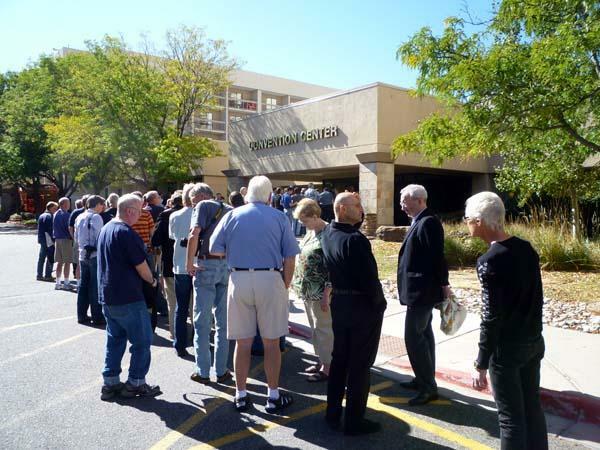 On the show's opening day, the line of attendees stretched through the entire lobby, out the hotel's front entrance, and wrapped around the parking lot. It's a beautiful day for a hi-fi show. 1. This show is massive. I think John Atkinson and I are feeling a bit overwhelmed by the number of exhibitors. I’m not sure that we’ll be able to see and hear everything that is on display. A strategy: John will start in the Tower and I will start in the Atrium, and tomorrow, we’ll compare notes and examine what we have and have not achieved. Meanwhile, Michael Lavorgna will cover computer audio for AudioStream, and Tyll Hertsens will cover headphone gear for InnerFidelity.